Peaceful and inspiring, Mirogoj is an unique graveyard with specific artistic and architectural value and historic significance - one of the most attractive places in Zagreb! Mirogoj is the biggest achievement of Croatian sepulcher architecture and considered one of the most beautiful European cemeteries. Before Mirogoj cemetery was opened, dead were buried on other cemeteries in Zagreb, depending on the place of residence, religion or class. During the 1860's, according to newspapers, small cemeteries were overcrowded and a new cemetery was necessary. In 1876. Zagreb had 24.000 citizens and 10 cemeteries - over 2.000 citizens on one cemetery. The most important cemetery before Mirogoj was Jurjevsko cemetery on Upper Town, where burials were held between 1622. and 1876. City council and archdiocese agreed in 1872. that cemeteries of Saint Roch, Saint Thomas and Saint George (Jurjevsko) should be closed. The same agreement declared that chapels of St Roch and St George should "give all their cash of 17.318 forints so a parcel for new cemetery could be bought, and city council should in return build a nice chapel for their services." But the story of Mirogoj cemetery actually started almost 20 years earlier when Ljudevit Gaj, a Croatian reformer, poet and Illyrian Movement leader bought a small forest and vineyard Heresinec on the hill north-east of Zagreb. During the following years, Gaj bough several neighbouring plots and expanded his property. He had the land levelled, filled in all the ditches and gullies and cleared the part of the vineyard and forest, had a road constructed and built a beautiful garden. This part of the land, where he spent the final years of his life, he named "Mirogoj", after former owner of part of the land Miroslav Herkul Mirogojski. Unfortunately, the cost of the project left Gaj in substantial debt, so it was arranged that his land should be auctioned after his death. After Gaj's death in 1872. the city council of Zagreb purchased the whole property on an auction,kept its name Mirogoj, and respected Gaj's wish that gardens should be preserved. Additionally, along the roads the city council decided to plant chestnuts, limes, maples, spruces and other kind of trees. The Mirogoj cemetery was officially opened on November 6th, 1876, it was divided according to religion, and to three different classes. Mirogoj was to serve as "joint cemetery", a burial site for all regions, which was pretty advanced for the period! Each of the religions received a specific area, depending on the number of followers and shared equal rights. Most space was designated for the Catholics, then for Orthodox, Jewish and Protestants, and was guaranteed "full and unlimited performance of religious burial rituals at the funeral of the deceased". As mostly everything new in Zagreb, new cemetery got its own share of debates. For some it was “inappropriate” and for others it was "awfully distant from the town centre" (Mirogoj was initially visited on foot, while those wealthy used a carriage). Both statements weren't true and Mirogoj soon became the most beautiful cemetery in Croatia. The first funeral was held on November 7th 1876 and it was magnificent! Not because the deceased, the fencing instructor and gym teacher Miroslav Singer was a well respected man, but due to the grandness of the occasion. Mirogoj arcades, the most recognizable part of the cemetery, were constructed according to the plans of German architect Herman Bollé, who worked on many large projects in Zagreb. From 1879. to 1917. he raised the North and South arcade, in 1886. built the morgue (on the spot where Gaj's summer mansion was), and in 1920. he made plans for the central dome that would connect the arcades, but he didn't live to see it constructed. Central part of the arcades, the portal and the chapel were built in 1929. The final result is beyond impressive - 500 meter long neo-renaissance arcades with 20 domes and one of the greatest projects of European historicism overall that survived the earthquake in 1880. completely intact. Just as a reference, more than 1700 houses in Zagreb were heavily damaged while the arcades were close to the epicentre. Many Croatian sculptors recognised the importance of the new cemetery and decided to contribute to the architectural marvel to give it artistic value. The work of Ivan Rendic, the founder of modern Croatian sculpture, is considered the first artistic stamp of the new cemetery. Other significant sculptors that contributed to Mirogoj were Robert Franges-Mihanovic, Rudolf Valdec, Ivan Mestrovic, Antun Augustincic, Frano Krsinić, Vanja Radaus, Grga Antunac and Zelimir Janes. By the time the arcades were completed, 100.000 bodies were buried on Mirogoj and a need to expand it became reality. Cemetery started expanding to the north, but in irregular shapes, because expansion was determined by surrounding properties. Mirogoj hasn't expanded more until recently. Until 1962. Mirogoj didn't witness much maintenance and inside walls of the arcades were almost completely destroyed by rain. Luckily, plans for maintaining and repairing the cemetery were brought and by 1971 the roofs and walls, 77 large and 69 small arcades, 12 domes on the big arcades and 5 on the small ones, parks, roads, paths, water supply and the sewage were completely repaired, adapted and renewed. It even got its own music ensemble in 1967! 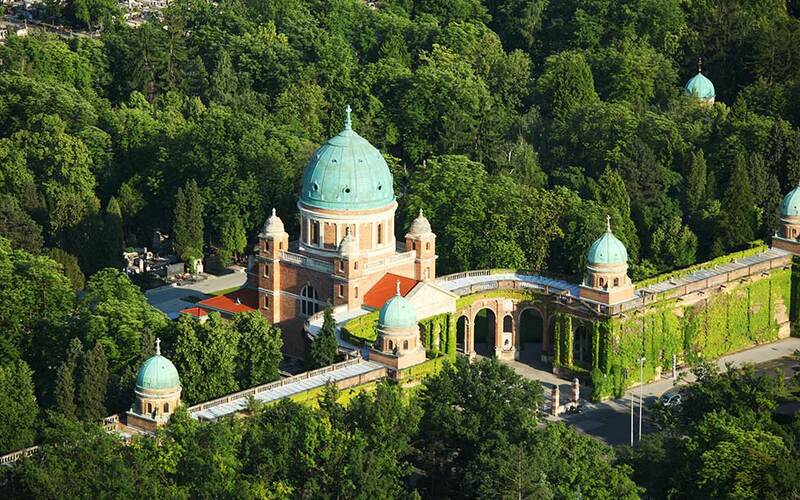 Mirogoj was opened in the year when Milan opened the first crematorium in Europe. Zagreb intended to open the crematorium on Mirogoj in the first part of 20th century, but due to lack of funds, this idea wasn't realised until 1985. That year, the Grove of Urns was opened also. Since then, Mirogoj hasn't changed much. Dr. Franjo Tudman, Ljudevit Gaj, Milka Trnina, Vatroslav Lisinski, Anton Gustav Matos, August Senoa, Ivan Mazuranic, Miroslav Krleza, Marija Juric Zagorka, Dusan Dzamonja, Herman Bolle, Tin Ujevic, Eduard Slavoljub Penkala, Ivana Brlić-Mazuranic, Dragutin Tadijanovic, Ante Topic Mimara, Drazen Petrovic, Ena Begovic, Edo Murtic, Vladimir Nazor and many more. You may hear an expression "mirogojcek" if someone ask you out for a drink, but don't get your hopes up. "Mirogojcek" is an other name for a wine of quality so bad "that will put you to Mirogoj in no time". It may be used for any other bad quality strong alcoholic drink, but it is most common when talking about Badel's Prima Brand brandy.